Portable music players are becoming more and more popular. I'm betting you use one of these regularly yourself so you can listen to your favorite beats, even while you're on the go. If you're the type who loves to share whatever it is you're listening to with others, then you might be on the market for a portable speaker. And if you happen to love cats, especially ones that dance, that I think I've just found the perfect speaker for you: the Dancing Cat. The fluffy little thing will literally groove to your tunes once they start playing. Just plug in your iPod or other music player, hit the "play" button, and watch this cat break down and do his thing. You can get the Dancing Cat from Amazon for around $20. 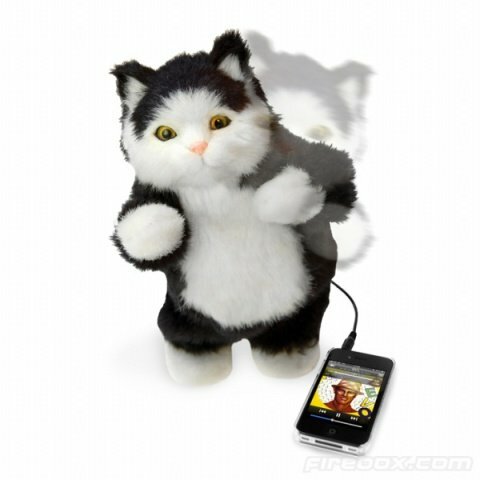 Will you getting one of these frisky cats to dance to the beat of your favorite music? Update: For dog lovers, in addition to the Dancing Cat, these speakers also come in the form of a Dancing Border Collie and a Dancing Golden Retriever.